Last week, Co-op CEO Steve Murrells joined Dr Richard Benjamin of the International Slavery Museum to award some very talented and creative students from Co-op Academy Failsworth. 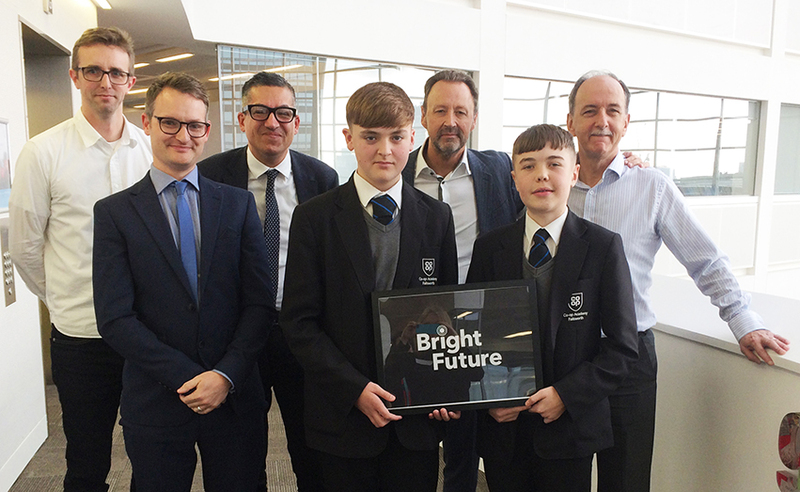 In July 2018, Co-op Academies Trust launched a design competition inviting the students to create a logo for the Bright Future programme, which offers the opportunity of a paid work placement to those rescued from modern slavery, helping them start a new life. A logo was needed to represent what the multi-partnership programme Bright Future has become, so getting the students to be part of that process was a fantastic idea. So far 15 other businesses, including Dixons Carphone, the John Lewis Partnership and The Body Shop, have signed up to the programme and have offered to provide placements. 22 charities supporting victims are also part of the programme. All the businesses and charities are working closely to create a nationwide network to support victims, co-ordinated by City Hearts and Co-op, to find suitable applicants for four-week paid placements. Daniel Aitken and Jamie Brabbin’s (Pictured below) winning logo will be used by Bright future as their official logo and will be used in all of their publications. Pupils have been invited to Liverpool Museum to understand Slavery and the impact their logo would have in the future.